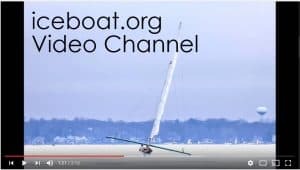 The Charles Bernard Boathouse Stern Steerer iceboat fleet on Lake Mendota. Frank Lloyd Wright’s elementary school is in the background. 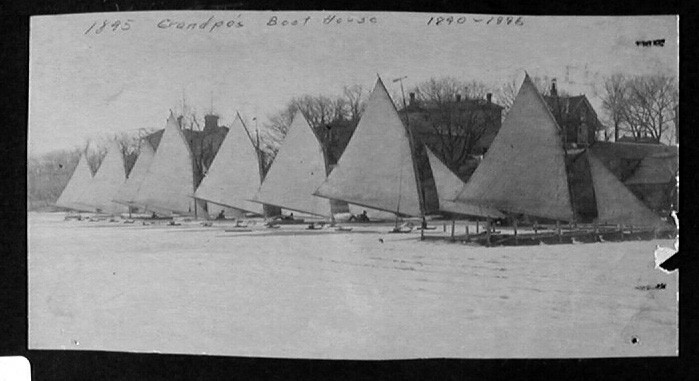 Though the photo dates from 1895, Wright would have seen the same boats on Lake Mendota back in the 1880s. Photo from the Bernard scrapbook collection.Notation by Carl Bernard. On the anniversary of the great architect, Frank Lloyd Wright’s 150th birthday, the Madison Children’s Museum is hosting a 3 day event that will include an exhibit dedicated to the iceboat models he made as a boy. The exhibit dates are June 7 – 10. Learn more about it at their website. Wright moved to Madison when he was 12 years old in 1879 and lived near the Bernard Boathouse, the center of ice sailing on Lake Mendota. He attended Lincoln School which was also on Lake Mendota, a few doors east of the Boathouse, where stern steerers gliding across the lake would have been a common sight. What a distraction and inspiration that must have been for the students! 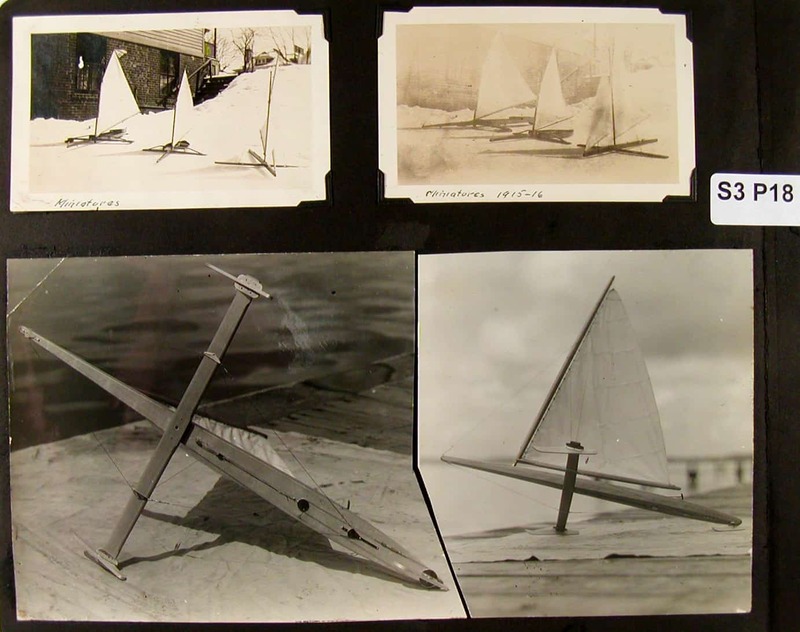 Model iceboats made by William and Carl Bernard. One of Wright’s biographies mentions that he made model iceboats as a boy. 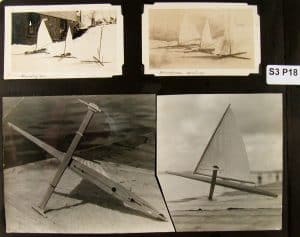 Though none of Wright’s boyhood iceboat models exist, a sophisticated model made by William Bernard (and restored by Bill Mattison) is in the collection of the Wisconsin State Historical Society. Read about that on the WSH website. I suspect that Wright, along with many boys in the neighborhood, would have spent time at the Bernard Boathouse watching Charles and William build boats. It would have been an exciting place for a boy with an inclination to become an architect. The roof of the Unitarian Meeting House. We know from a recording of Carl Bernard in the Wisconsin State Historical Society archives that when he was in Madison, Wright continued to drop in on the “boys at the Boathouse”. It could have been at the Boathouse where learned of master carpenter and iceboat builder, Frank Tetzlaff, famous for his part in building the MARY B stern steerer. 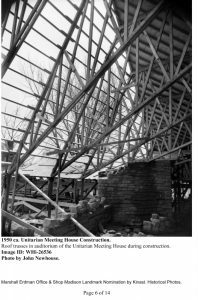 In the early 1950s, Wright’s complicated roof design for Madison’s Unitarian Meeting House was proving difficult to build. 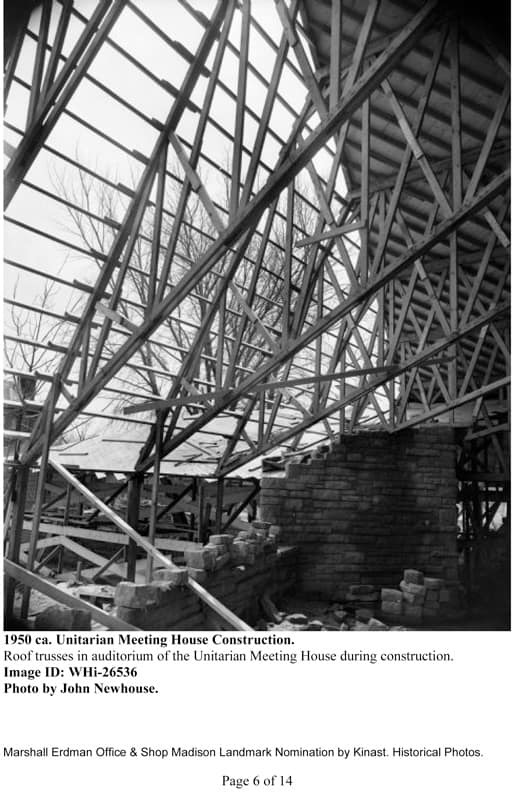 It was Frank Tetzlaff who “helped translate” Wright’s plans. Frank Lloyd Wright, much like the aviator Charles Lindbergh during his brief stay here, was drawn to the sport of iceboating and the people in Madison who were obsessed with building and sailing them.